Forever worried about what your previous client could do to that business card you so proudly gave him? Well he could just tear, scratch, scuff, stain, or burn it. He could probably also forget it somewhere, while your name and designation on that piece of paper fade away, never to be read again. There’s a way around that now, a green way indeed. 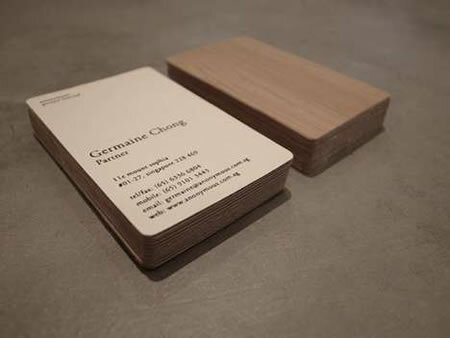 Sustainable and eco-friendly business cards, with a bamboo veneer, a great alternative to the paper and plastic coated ones. These are break-proof too, if that’s what’s crossing your mind now. These cards, by Anonymous, a company with a name that chooses not to remain a name, are indeed a great give-away that your clients wouldn’t help keeping safe and sound. So you might just be a green-hearted person or just someone who wouldn’t like his business card to be taken lightly, the bamboo business cards by Anonymous are for you! PC cases go woody with Foxconn’s eco-friendly bamboo PC chassis!